For scientific research purposes such as determining sea level (rise) change. For the basis of tide predictions. There must be a long term and accurate set of sea level observations to generate accurate and reliable tide predictions. For maritime safety purposes, real time sea level measurements are used to calculate under keel clearance for vessel movements. Tidal levels (or planes) are calculated from long term sea level measurements and used for coastal development and as reference levels for emergency response in coastal regions. The problem with measuring sea level is that sea level is changing on several time scales, from the most frequent changes of surface waves to less frequent tidal variations and climate induced changes. The type of instrument used to measure sea level is dependent on the purpose or use of the measurement. The aim in measuring sea levels is to measure the vertical distance between the average surface of the sea and a fixed datum level. The level must be averaged to smooth out the influence of wind waves. There are three main methods of measuring sea level; surface following; fixed sensors or remote and mobile. Float based tide gauges still form a large part of the global network of tide gauges. The paper charts used to record the level have been made digital with the use of shaft encoders. Even if they are now being replaced with acoustic, pressure and radar systems, they were the source of most of the historical sea level record. 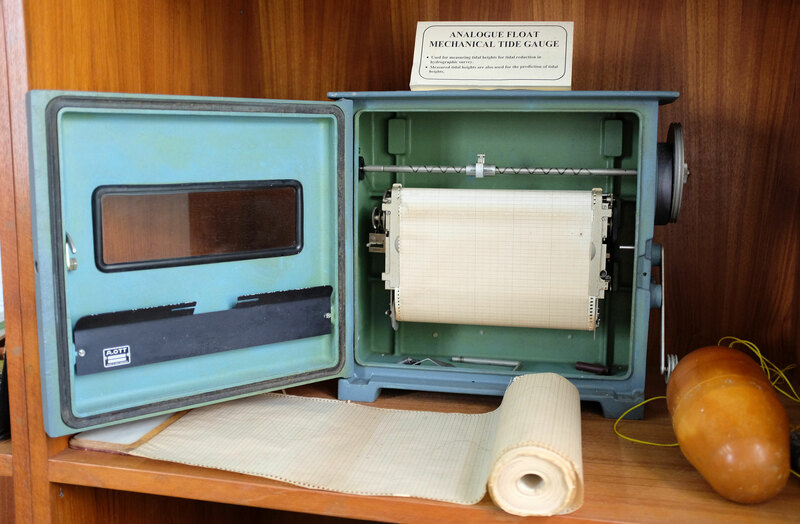 This type of tide gauge requires a high level of attention due to mechanical parts and the need to change the paper chart regularly. Surface following analogue tide gauge, source Flickr:Jnzl's, ccby. This analogue tide gauge uses a float to follow the water level. 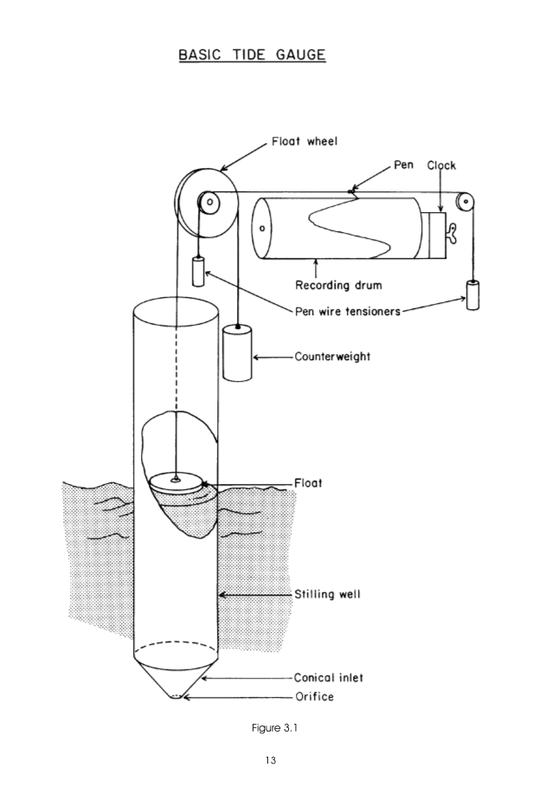 The float is normally attached by cable and pulley to a mechanism that records the smoothed sea level on a paper chart relative to tidal datum. 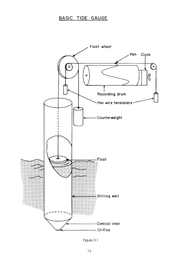 Smoothing of the levels is achieved through placing the float within a stilling well. 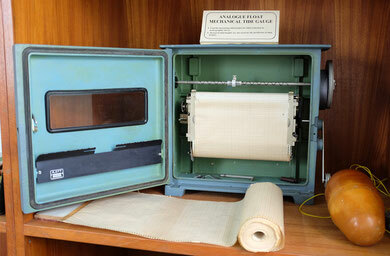 This preserved analogue tide gauge is on Raffle Island Light house in Singapore. 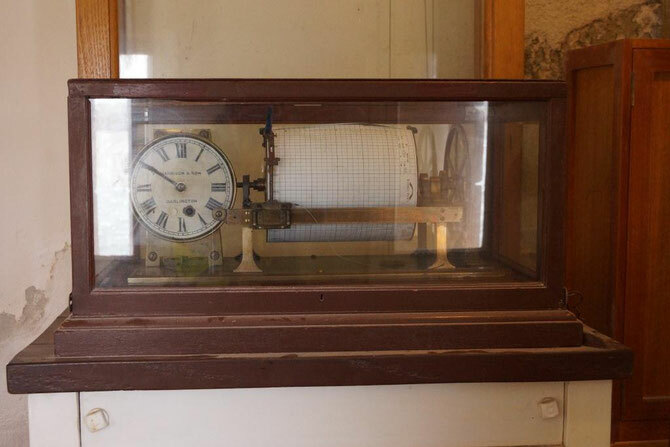 Harrison & Sons tide gauge installed in 1908 at Fort Denison, Sydney. From Sydney Ports, "my port"newsletter. Typical microwave (or radar) based sea level sensor. 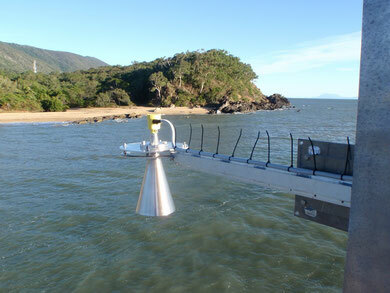 The most common method for measuring sea level in Australia is with what is called a radar sensor. The radar uses microwave pulses to determine the distance from the sensor to the average water surface. The antenna system of the radar sensor sends out extremely short microwave pulses that are reflected by the sea surface and received by the antenna system. The time elapsing from emission to reception of the microwave pulses is proportional to the distance from the sensor to average sea level. A special time-stretching procedure makes a certain and exact measurement of the extremely short intervals possible.